Many people probably have memories of running their very own lemonade stand when they were a child. The lemonade stand is usually one of the first experiences children have with business. 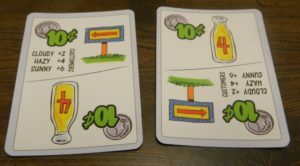 Today’s game Lemonade Stand takes the concept of a child’s first business and turns it into a light economic card game. 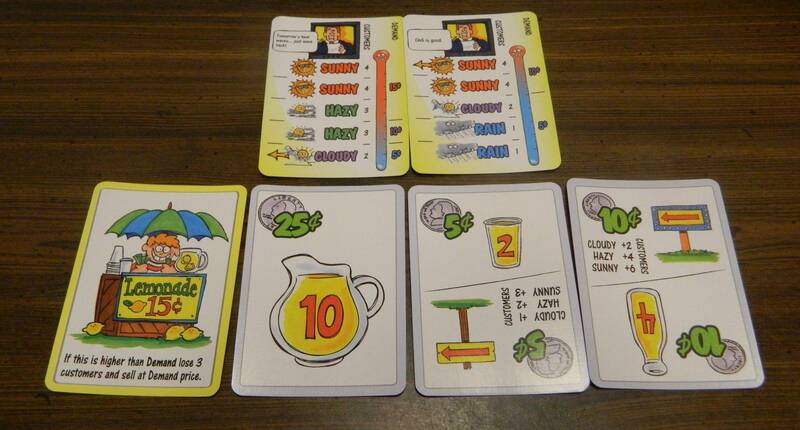 Players have to decide on how much lemonade to supply and advertising to run based on what they predict the weather will be for the day. Lemonade Stand succeeds in being a light accessible economic game but also relies a little too much on randomly guessing what the weather will be for the day. Each player takes a set of stand cards. All unused stand cards are returned to the box. The other cards are separated into five piles (nickels, dimes, quarters, dollars and weather). The dollar and weather cards are shuffled and placed face down. The coin piles are placed face up. Each player takes 25 cents worth of coins (in the distribution of their choice) along with one dollar card. 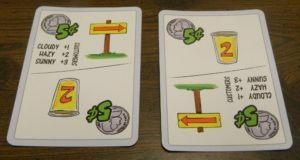 The player takes all of their cards into their hand. Flip over the top weather card to reveal the forecast for the first day. Players look at the weather card already on the table to see the weather forecast for the next day. 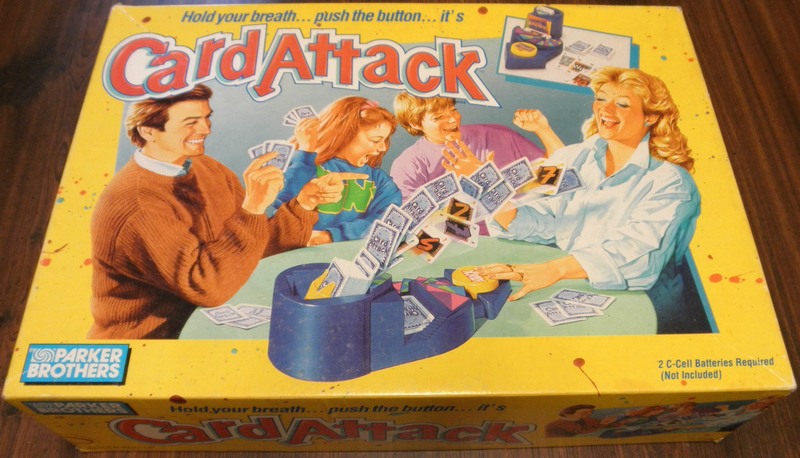 Each player will have to play one stand card and one to three coin cards face down on the table. When playing coin cards you should orientate them so your choice for the card is pointed away from you. When everyone is ready they reveal the cards they chose to play. The 5 cent card can either be used as two cups or as a sign that brings one additional customer on cloudy days, two extra customers on hazy days, and three extra customers on sunny days. 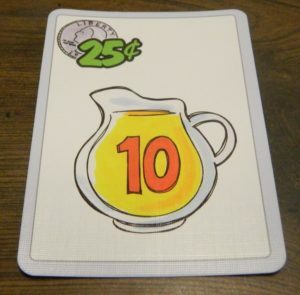 The 10 cent card can either be used as four cups or as a sign that brings two additional customers on cloudy days, four extra customers on hazy days, and six extra customers on sunny days. 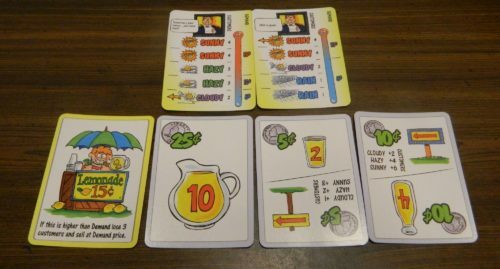 The 25 cent cards can be used as ten cups. Once everyone has played their cards, the next weather card is flipped over and placed next to the previous weather card. The arrow on the side of the most recent card determines the weather of the current day. 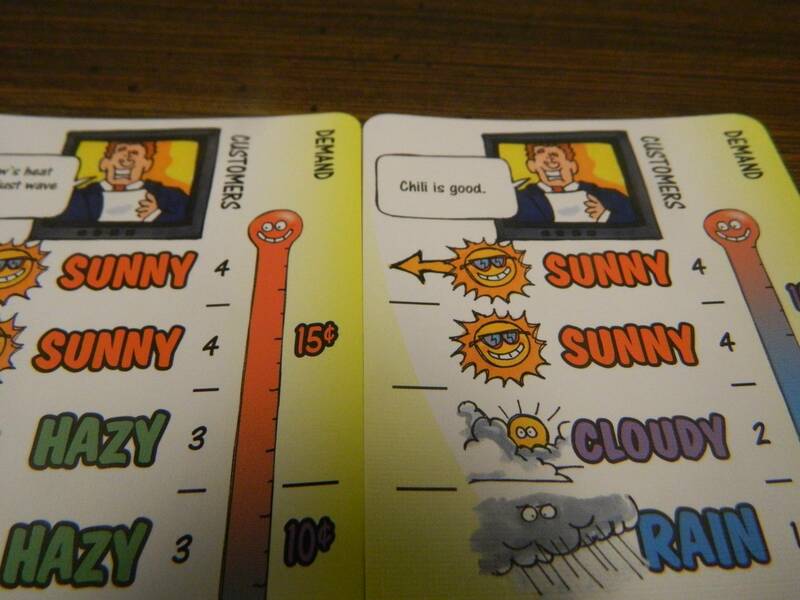 To determine today’s weather you look at where the arrow on the right card is pointing to on the left card. Since it is pointing at sunny, the weather for the day will be sunny. Players then have the opportunity to play dollar cards. If more than one dollar card is played the cards are resolved in the order of the lowest numbered card to the highest numbered card. 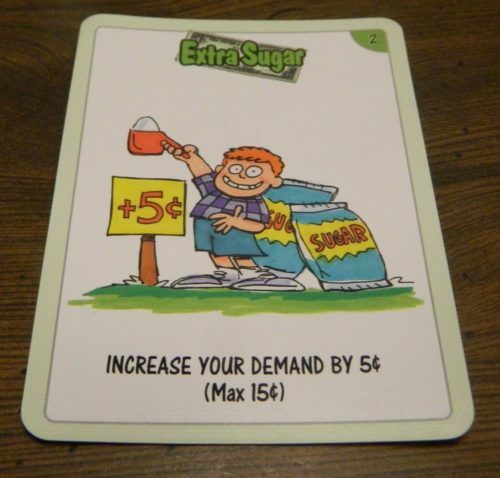 By playing this dollar card the player can increase their demand price for $0.05 for one turn. Players then will determine how many sales that they have made for the day. The number of sales that a player will make is the lower number between the number of customers they attract and the number of glasses they have available. The number of glasses available is equal to the numbers printed on the cards that were played for glasses. 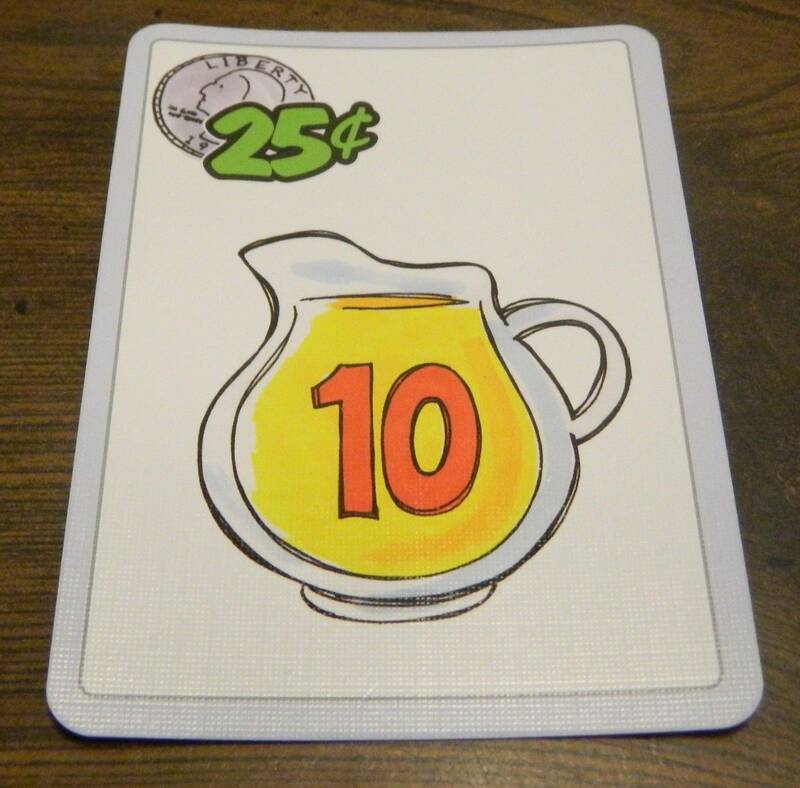 This player has played two cards for six glasses of lemonade. The players will automatically attract the number of customers equal to the demand from the current day’s weather. Today’s sunny weather has created demand for four customers that are willing to pay $0.15. Players will receive additional customers for any coin card used as a sign dependent on the weather for the current day. 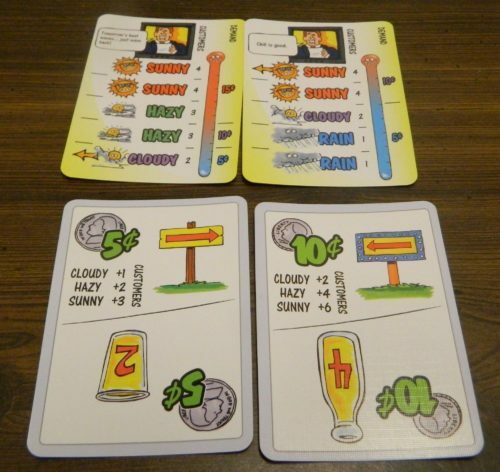 Since the weather is sunny the player will get three customers from the sign on the left and six customers from their sign on the right. Players will lose customers if they charged more for their lemonade than the demand price based on the weather. Today’s weather has created a demand price of $0.10. The player is charging $0.15 though so they will have to sell their lemonade at $0.10 and they will lose 3 customers. When a player has determined how many sales they have made, they multiply their customers by either their stand price or the demand price (whichever is lower). Players take coin/dollar cards of any type equal to the total sales they had for the day. When taking coin cards a player may never have more than four coin cards of the same value. This player has twelve glasses of lemonade for sale. The player has attracted four customers due to the weather and six customers due to their sign. Since they only have ten customers they will sell ten glasses of lemonade at $0.15 for a total of $1.50. Players return all of the coin cards they used during the round to the appropriate piles. All dollar cards used are turned face down and kept in front of the player. Players return the stand card they used to their hand. The previous day’s weather card is discarded and the next round begins. If at any point a player has no coins in their hand, they may take one 5 cent card for free. The game ends after seven rounds/days. The player with the most money wins the game. The top player has acquired $2.25, the middle player has acquired $2.20, and the bottom player has acquired $1.50. The top player has the most money so they win the game. 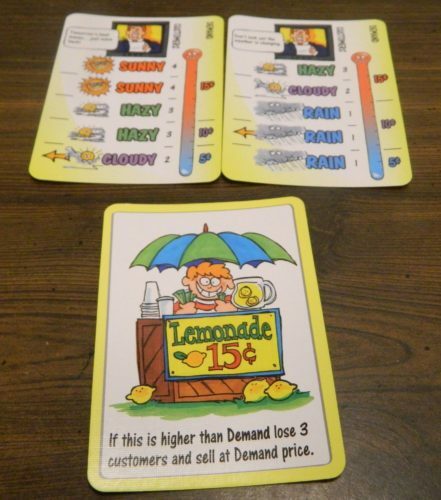 While I would consider Lemonade Stand to be an economics game, I would consider it to be a very light economic game. Basically in Lemonade Stand you need to try and judge demand each day while also providing enough supply to meet your demand. You need to figure out how much to invest in inventory as well as advertising in order to maximize your profit. You don’t want to spend too much that you end up losing money but if you don’t spend money you won’t make any money either. People who like heavier economic games will probably find the game to be a little too simplistic. I think Lemonade Stand would work well with children and people who don’t play a lot of board/card games though because the game can be taught to new players in minutes. I had a decent amount of fun with Lemonade Stand but I will admit that I wish the economic aspect of the game was a little deeper. I would say the most unique element of Lemonade Stand is the weather mechanic. 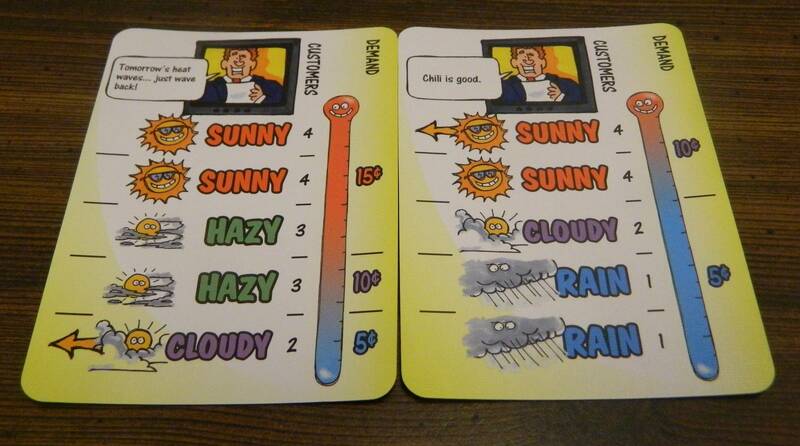 Basically the players are given a weather forecast which gives the odds of various types of weather. By looking at the weather forecasts players can see the likelihood of each type of weather. Players use this information to determine how they want to approach the next day. Players never know exactly what the weather is going to be though since the next weather card will determine what the actual results are for the day. There are also the outlier weather cards which make the day either really sunny or stormy which totally ignore the previous weather forecast. What I like about the weather mechanic is that it is quite clever in its’ simplicity. All you have to do for the weather mechanic is to flip over the next weather card. While the mechanic is really simple I like it since it adds some interesting mechanics to the game. For the most part you are probably going to want to play the percentages. For example if there is only a one in five chance that you will be able to charge 15 cents but there is a four in five chance that you can charge ten cents, it is generally a good idea to just charge ten cents since you can still charge quite a bit and will likely avoid the penalty. If the weather forecast mostly predicts bad weather though there really is no reason to spend a lot of money on the day since you likely will lose money. The weather mechanic is the real driving force behind the game. 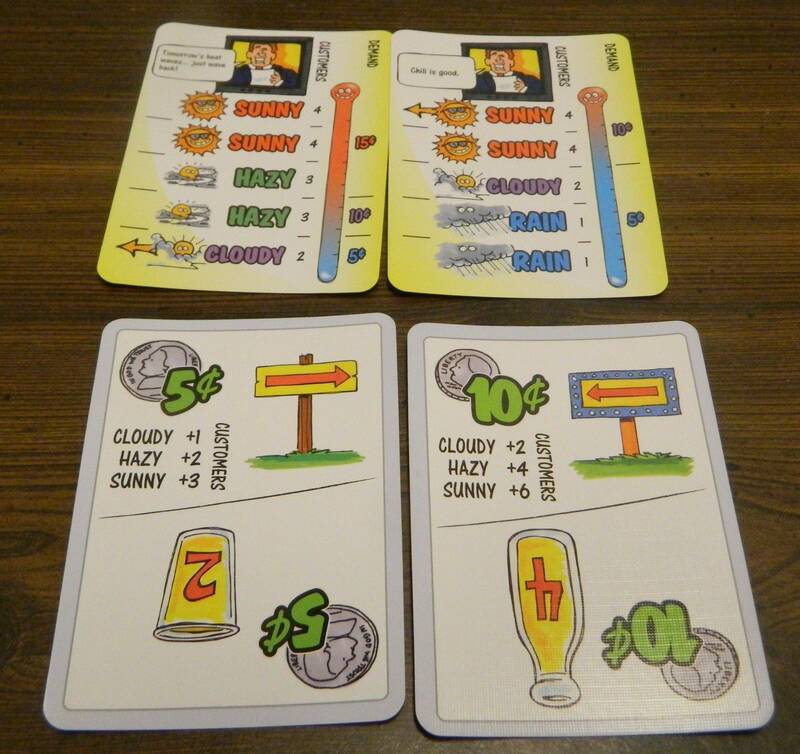 While the game has some light economic mechanics, the weather mechanics drive your success or failure in the game. In order to do well in the game you need to be good at predicting the weather for the next day. The player that is best at predicting the weather will win the game as they will be able to charge higher prices and be able to sell more glasses than their competition. While players are going to want to usually play the percentages, you are going to have a hard time winning the game if you never take any chances. If everyone just plays the percentages every day, basically everyone will end up with the same amount of money. The only way to ever get a significant lead on the other players is to take a risk that none of the other players decide to take. With the weather mechanic playing such a big role in the game, it does lead to quite a bit of reliance on luck. While you can play the percentages to improve your chances in the game, luck is likely going to determine who will win the game. At least once during the game there will be a day where the weather is either considerably worse or better then expected. Whoever bets right in these situations will likely win the game. As you can’t predict when they are going to happen, you need to just be lucky and guess correctly. Another issue with Lemonade Stand is that it has the potential to have a runaway leader problem. If a player places a big bet on a day and it pays off, the other players are going to have a hard time catching up. There is a limit on how much money you can make in a day (due to only being able to play three cards) and if you make close to that amount in a day it is going to be hard for the other players to catch up. When you get out to an early lead you can use that extra money to increase your lead as you will be able to serve more customers. While most games are going to be pretty close as most people will make similar moves each round, if one player gets out to an early lead the game’s ending is probably going to be kind of anti-climatic. With the potential for a runaway leader, it is good news that the game is quite short. Once everyone knows what they are doing I would expect most games to only last 15-20 minutes. I see this both as a positive and negative. On the positive side it reduces the issue of runaway leaders. Also for the type of game that Lemonade Stand is, I see it becoming a little repetitive if it lasted much longer than 15-20 minutes. On the negative side though I think the game would have benefited from having a couple more rounds. With only seven rounds the game kind of feels like it ends as soon as it begins. If you have one bad round you are going to have a hard time catching up. While it would make the game a little longer, I think the game would have benefited from having around ten days. The final complaint that I have with Lemonade Stand is the fact that you can only play three coin cards each day. I agree with the game having a limit of some sort since otherwise players could play a bunch of cards and make a lot of money in one day. With only three cards though you aren’t able to do everything that you otherwise would want to do. If you fall behind good luck catching up without taking huge risks being only able to play three cards on your turn. I think the game would have benefited from letting players play five or six cards each day. Before wrapping up the review I want to quickly talk about the game’s components. While the game only comes with cards, I actually liked the components quite a bit. 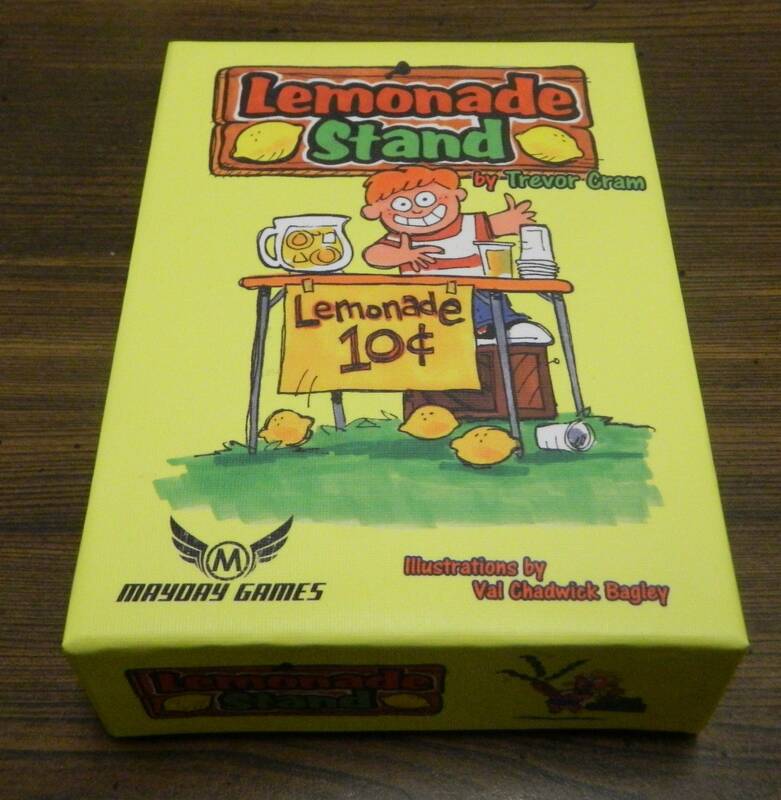 The reason I liked the components was because the game does a really good job with the lemonade stand theme. The artwork for the most part is cute and does a good job supporting the theme. While I would always prefer more cards, I think the game has enough to keep the game interesting for quite a few games before it becomes repetitive. Should You Buy Lemonade Stand? 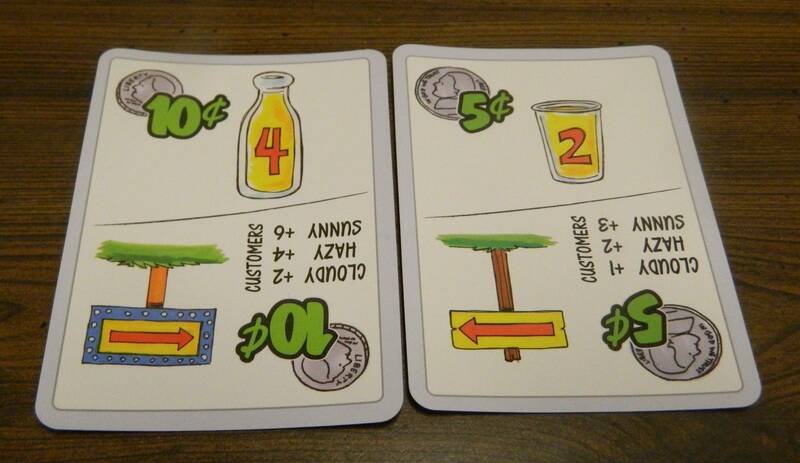 Lemonade Stand is a pretty interesting little economic card game. Basically it is one of the lightest economic games you are ever going to find. Basically you need to predict the demand for lemonade for the next day in order to set your prices, get your lemonade supply, and determine how much advertising to run. The way the game handles the weather is quite creative as it gives players the ability to play the odds while also adding a decent amount of randomness to the process. This does create some problems for the game though as you need to be good at guessing what the next day’s weather is going to be in order to win the game. If a player makes a good bet early in the game they could get out to a huge lead which will make it really hard for the other players to catch up. Being a very light economic game I don’t see Lemonade Stand appealing to everyone. If you are more interested in heavier economic games or don’t have any interest in economic games I don’t think Lemonade Stand is going to be for you. 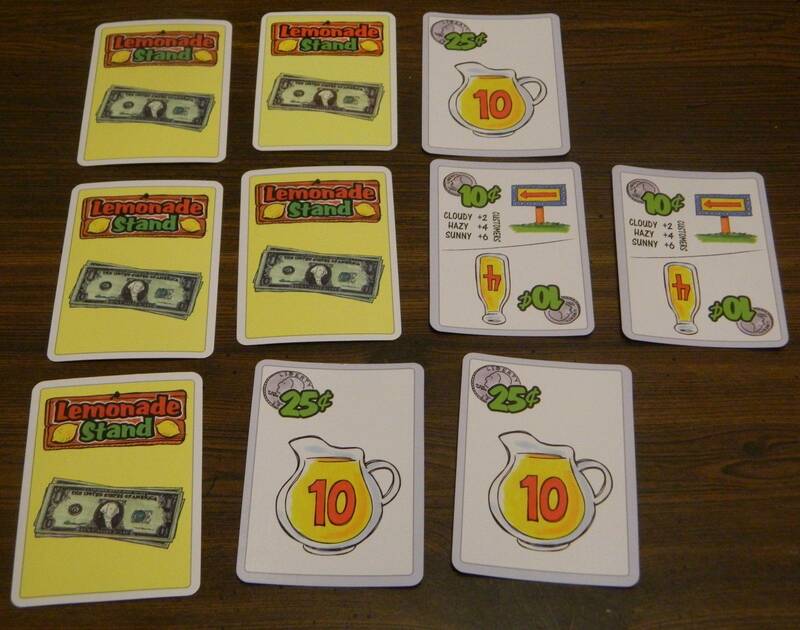 If you are looking for a quicker lighter economic game though for children or people who don’t play a lot of board/card games I think you could get quite a bit of enjoyment out of Lemonade Stand. Successfully creates a very light economic game. Should work well with children or people who don't play many board/card games. Relies too much on randomly guessing the next day's weather. Has a potential runaway leader problem.